Join the Quilt Corner for a fun eleven month Block of the Month program. 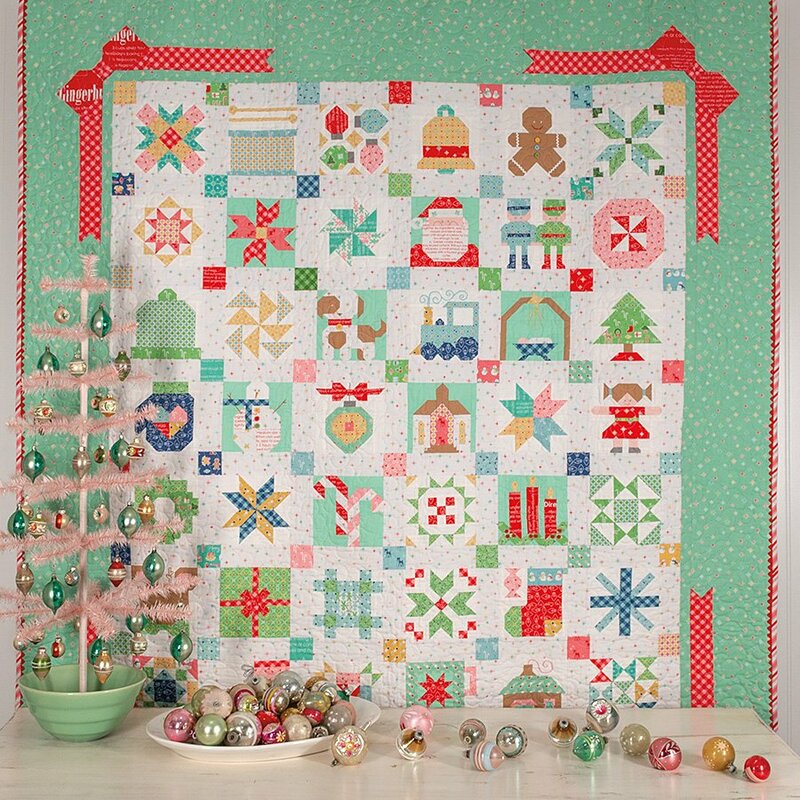 Whether you choose to participate online or drop in to the shop for a sew-along, you'll enjoy making this lovely vintage inspired Christmas Sampler quilt. What will you get in your program? In months 1-10, you will receive a kit with 4 - 5 blocks, each month. 12 yd. roll of very pretty red vintage trim to finish your binding with an extra-special finish. Basically, everything you need, except your quilt back and we will offer an option for that also! Blocks will finish at 6 inches. Your book includes instructions for both 6 and 12 inches. WANT TO JOIN US AT THE SHOP TO SEW ALONG? Join us on the 4th Friday of the month, beginning November 23rd from 5-7pm for a Sew Along. We will have your blocks ready for pick-up, present tricks & tips for making the blocks and have a whole lot of fun! Get started today by reserving your spot with the $25 sign-up fee. Each month for the next eleven months, beginning the 3rd week of November, we will auto-bill your card for $27.95 and ship your blocks or you can request in-store pick-up. The program includes free shipping in the continental US. Your 1st month will include your copy of Vintage Christmas by Lori Holt, the book that will be used to construct all the blocks. We will announce to all our local customers the Vintage Christmas Sew Along date which will be in the shop classroom and provided at no additional charge to program participants. Sign up today and don't miss out on any of the excitement with this fun program! To see all the fabrics & embellishments available for this program, click here. Materials Included: All materials to complete the quilt top, pattern book, embellishments and binding.